Fixed on Floradix: Pumping the Iron! I guess it might not be somewhat surprising that after Western States (it being my first 100 miler) I was somewhat tired. Of course, if I told this to a non-runner, they would say 'Doh! You have just run 100 miles, of course you are tired!' I guess part of the trouble was I was so excited with my race result and the fact that summer had finally arrived in the Rockies that I was just raring to run even more! So after a week of rest I eagerly bounded back out onto the trails and was having fun except I just felt sloooooooooow. Like I was running in toffee with lead weights in my shoes slooooooooow. The worst was probably when I turned around only a little over half way through a normal 2-hr planned road run. I promtly planted myself on the couch and seriously did not want to move. I NEVER turn around on a run. Just NEVER. But the toffee like feeling in my legs was so bad that it didn't seem worth plodding away any more. In fact, it didn't seem possible to plod away anymore. Next day I walked into the medical centre (an at-most once-annual occurance for me) and as luck would have it there was a walk in appointment available in 10 minutes. My luck got even better when the doctor not only was a friend of a friend, but also knew about my running and was a runner himself. He totally understood that I didn't want to just be told to take a bit of time off running. Though he did concede that maybe more sleep might make me feel less tired! But he was more than happy to do a blood test and explain what he was looking for and what levels I should be looking for as a runner, rather than just as someone who was mildly active. Less that 24hrs later he called me with the results (got to love small town living in a mountain community!) and said that I was not anaemic but my levels of stored iron (ferratin) were low enough that this might explain some of my lethargy. He also said that my B12 levels were a little low and getting those higher could only help. So for the last few weeks I've added B12 and Floradix Formula to my daily regimen that already included Udo's Oil. I've also been focusing on getting lots of leafy greens and beets every day. 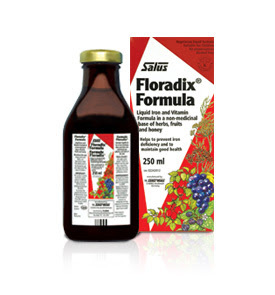 Floradix (made by Flora, who also make Udo's Oil) is chocked full of liquid iron (most easily absorbed, rather than the tablets) and vitamins. I've definitely been feeling much better for it. Although I've always said that I prefer to eat real food over taking supplements I definitely feel there is a place for the right supplements based on good medical advice. I personally feel too many people buy things off the shelf based on thinking what's good for them rather than following advice on the basis of tests. And it is also important to take the right supplements rather than simply believing all that the packing says. It was also a good reminder that it can be worth once every so often getting tests done to see where you are at, especially when training for or keying for a big race. Next big race for me...World 100km, 2 weeks today in Winschoten, Netherlands! Every time I run a road marathon I realise how much I enjoy them and swear that I will fit more into my race schedule but usually that doesn't end up happening with too many ultras getting in the way. 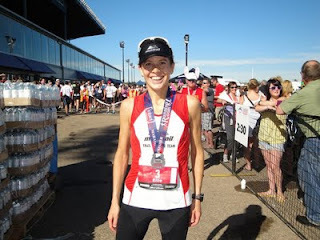 So as I lined up for Edmonton marathon yesterday it was my first road marathon since the same race a whole year prior, and as ever I was training for an ultra so hadn't trained specifically at all for the marathon. I had no idea where I was at in terms of pace and was mostly using this as a training run for World 100km in 3 weeks time and as a gauge to see where I am at. Immediately I went out ahead of pace, on about 3:55 min/ km pace. But it felt easy. I was unsure what to do - maybe I had more leg speed in me that I had thought? Maybe I would pay for this at the 30km+ mark? I kept thinking of Coach John Hill from Vancouver Falcons and I suspected he would have been telling me to back off a little. But I decided to roll with it and if a few kms were a little fast then better to learn now than at Worlds. About 10 men pulled ahead of me, I was lead woman and I was left running solo with a couple of men in sight in the distance. I was glad to have my garmin to help me monitor my pace and stop myself from going out even faster. I am not sure where it was, maybe as early as the 10km mark or so and I found myself running with one other guy, who I found out to be Shane Ruljancich (member of the Canadian Mountain Running Team). Shane and I got chatting, established that we were looking for similar finishing times and settled in to a good pace, side by side. For a few kms I didn't check my pace at all as we chatted easily along and the kms felt easy. I then got back to checking pace and noticed that quite a few kms were hitting sub 4:00 min/ km and it crossed my mind that maybe I was going a little too fast, but equally I was prepared to risk this rather than pull back, lose time and also lose my new running buddy. It was a hot and sunny day (it got up to 30 degrees) and very early on I was wishing I had a handheld water bottle. The aid stations were every 3km or so but once half a small dixie cup got spilt I was left with just a tiny mouthful of water or gatorade to quench my thirst. This was made worse as I was taking on my Clif Shot Bloks and my mouth only got drier. At a couple of stations I managed to grab 2 cups and later on I even used a sponge to get water, but for pretty much the whole race I knew I was not getting enough fluid on to really do my best. We ran through the 1/2 marathon mark at 1:23:38. I was happy with this; it was ahead of my 2h50 to 2h55 target but not crazy fast and I was still feeling pretty comortable. Shane and I were still running side by side and we soon began to gain on and then pass a few guys which was a confidence boost that we had paced ourselves better than some, and I was also glad to see Shane gaining a few positions in the mens field. By 30km I was definitely beginning to work a little and I was wondering if I was going to pay the price for my faster-than-planned pace. We had now hit our 2nd out and back section where although the course appears very flat on the profile it actually has a few gentle rolls that you begin to feel at this stage in the game. Shane and I were still clocking our splits which began to vary a little depending on the slight hills, but still stayed within the 4:00 min/ km range. Our conversation was now short comments rather than a flowing conversation as we began to work harder, or I did at least; Shane appeared to still be on cruise control. The kms stretched out, each one seeming longer than the last, as I counted them down one by one. I took on my last gel with a small amount of water but I was definitely beginning to feel the effects of not being able to get enough gatorade and fluids for the heat of the day. Although I was working it was more the fact that I just felt I needed calories and liquids that was making the run hard. Even as I hit the final km I didn't have my usual finish line push, but I hadn't lost pace either and was delighted to roll over the finish line, 1st place woman with a new PB of 2:47:14. More than being delighted with a PB I was just happy to get a few bottles of water and a banana on board within minutes of crossing the line. Big thanks to Brian Torrence (elite director) and all the fab volunteers who make Edmonton a super event, and one I'll be sure to go back to in future years.